MidNite Classic charge controllers offer many useful features including Arc Fault Detection and Ground Fault Protection (GFP) which eliminate the need for a separate GFP breaker assembly. Three sizes are available to accommodate solar arrays with operating voltages up to 150, 200, or 250 VDC. A feature called HyperVOC protects the controller from damage when open circuit voltage exceeds the operating voltage by a margin equal to the battery bank voltage. For example, the Classic 150 will operate normally with up to 150 VDC of input but, when used with a 48 VDC battery bank operating at 50 VDC, will withstand up to 150 + 50 = 200 VDC. This allows you to maximize array size even when using higher voltage battery systems. The table below represents maximum power only; be sure to consult the power curves in the user’s manual when sizing your PV array as allowable current varies with array voltage. 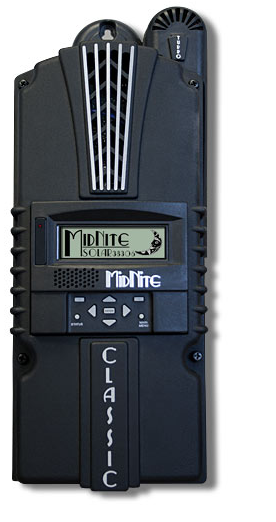 MidNite Solar’s Classic controllers have MPPT modes for solar, wind, or hydro with user adjustable power curves, and a learning mode for self-optimization. Classics can be stacked to act as one large controller without a separate HUB. They have two auxiliary outputs, a dry contact relay and a 12 VDC output. The Classic has built-in Ethernet and USB and RS-232 ports for two-way communication. An internal IP address enables the Classic to directly output operating data to the Internet or a local network without a central server. Each unit also has 32 MB of internal memory for data storage. A built-in setup wizard covers battery bank size, string voltage, wind turbine selection, power and wire loss, PV breaker sizing and more. Firmware is user upgradeable using downloaded files. Each unit includes a sealing kit for dusty or salt-air environments, but sealing can reduce output by up to 20%. Use MidNite 300VDC breakers for power source voltages over 150 VDC. Make sure that the breaker will fit into your DC power center, or use a separate MidNite Big Baby Box to accommodate the breaker. On the battery side of the controller, breakers need only be rated for the highest battery charge voltage. The Classic Lite version of each controller is a lower-cost option that omits the programmable user interface in favor of simple DIP switch programming. The MidNite Graphics Display Panel (MNGP) is a remote LCD display that mimics the interface on the Classic charge controllers. It can also be used with the Lite versions of the Classic series. The MidNite Clipper enables Classic charge controllers to work with wind or hydro turbines. * Maximum output current is reduced at higher array voltages. See manual for more details. ** Output currents over 80 A require 110A or 125A breaker. Verify that there is sufficient space in the DC Power Center or breaker panel. Be the first to review “MidNite Solar Classic 150 MPPT Charge Controller” Click here to cancel reply.